We just had to share this fabulous promotion going on now through July! 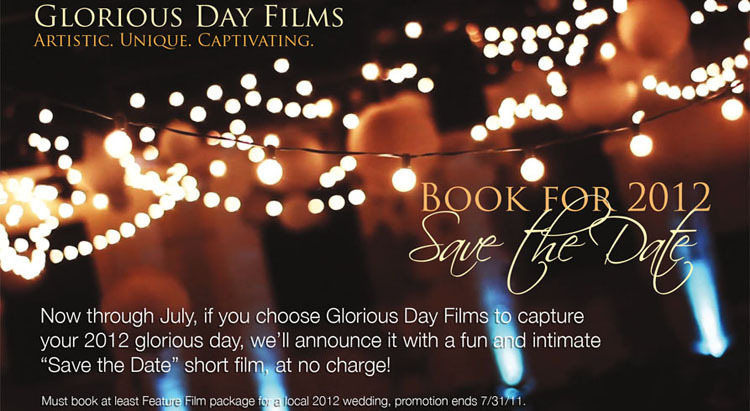 If you book wedding videographers Glorious Day Films for your 2012 wedding celebration, they will help you announce the big day with an oh-so-cute “Save the Date” short film at no charge. To find out more about Glorious Day Films and to check out some of their incredible work, visit them online! Make plans to join JJ Kelly Bridal Salon as they host a Claire Pettibone trunk show June 10 and 11. You’ll be amazed by this incredible line of dreamy gowns exclusively available in Oklahoma at JJ Kelly Bridal Salon. Call 405.752.0029 today to make your appointment for this fabulous trunk show. Cheers! « Previous Post: Ca-Hoots 2-3-4!